The medical manufacturing industry is on an upward growth trajectory, fueled by a strong economy and steady demand for products. Medical manufacturing industry is no longer deemed as a mere centre of building physical devices. The changing consumer demand, the nature of products, the economics of production, and the supply chain have led to a fundamental shift in the way companies do business. As technology continues to advance exponentially, barriers to manufacturing, commercialization and learning are eroding. Medical manufacturers today are using the right materials and additives to increase the strength, flexibility, and customization options for medical devices and surgical instruments. The right materials can improve the performance of the medical device by delivering greater capabilities, higher accuracy, and increased patient comfort. The rapid technological developments in home-use devices such as glucose monitors, insulin delivery devices, nebulizers and oxygen concentrators are also creating a positive impact in the industry. The use of remote communication technology to allow healthcare professionals to support home-based patients is further aiding to the preference for home and self-care. The medical device industry is increasingly pivoting toward a design-for-value orientation and much more cross-functional integration of the marketing or commercial functions. Along with the efforts to control costs, manufacturers also aim to significantly shorten and tighten up waste in the supply chain in order to advance manufacturing developments. 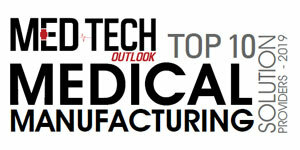 This edition of MedTech Outlook features companies that are at the forefront of offering medical manufacturing solutions. In the last few months, a distinguished panel comprising CEOs, CIOs, VCs, and analysts including our editorial board reviewed the top companies in the MedTech domain and shortlisted the ones that are at the helm of tackling challenges in the medical manufacturing industry. The companies compiled in this issue have exhibited extensive business process knowledge, along with in-depth and innovative strategies in the space.